Welcome to the New American Dream Project at GoTinyBeFree.com! Tiny House Community/Subdivision developments & upcoming Tiny House on Wheels (THOW) Building workshops! “Tiny Houses” is a huge emerging trend – and for good reason! Many Americans are frustrated with not being able to achieve the American Dream they were sold – most are in fact living the American Nightmare! We want Americans to be able to achieve and live the dream of freedom they believed in. That’s why we are creating the “New American Dream Project” – an initiative to provide real freedom to Americans through Tiny House on Wheels Communities and Tiny House Living. Because you deserve to be free and we want to help you live that dream, reduce your monthly housing expenses, increase your disposable income, travel and be more mobile and live the dream that you deserve. We are in the process of developing this site so come back here often and check with our facebook page above for the latest news and information. 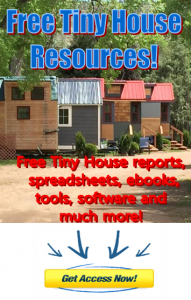 We are also in the process of producing a podcast and THOW (Tiny House on Wheels) Building Workshop series for the Tiny House community to bring together Tiny House builders, innovators, events, feature Tiny House dwellers and share their stories, provide resources and of course share the latest information on our intentional community project, The New American Dream Project. Lots more to come! Stay tuned! Hans Schoff, the founder, is in the middle of building his Luxury Tiny House on Wheels (THOW) – a 32-foot Gooseneck trailer with an 8.5-foot deck over the gooseneck totaling over 40 feet (~400sf, including the loft). You can follow Hans’ Tiny House build progress by clicking here.